The Federal government has officially launched its national campaign against Fake news. 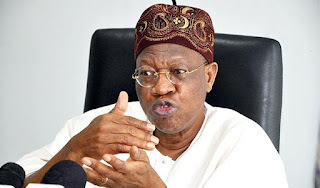 Speaking in Abuja on Wednesday, Minister of Information, Lai Mohammed pointed out that urgent measures needed to be taken to curb the spread of fake news. There is an epidemic sweeping the world. If left unchecked, it could be worse than all the plagues that the world has recorded put together. It is a clear and present danger to global peace and security. It is a threat to democracy. It is the epidemic of Fake News. Mixed with hate speech, it is a disaster waiting to happen. For the media, the epidemic is even worse. This is because fake news, in most cases designed to misinform, undermines confidence in the media. And once the people lose confidence in the media, the society is in trouble. Let’s be straight. Fakes news is not new. It is said to be as old as the printing press. What has made it an issue of concern is the means and speed at which it is now spread around the world, and that means is the social media. Anyone with a phone and internet access can author and make fake news go viral in minutes. With the number of mobile phone users in the world expected to pass the 5 billion mark by 2019, you can see the kind of crisis we face. The global epidemic of Fake News is already having far-reaching repercussions across the world. A recent study by researchers at the Ohio State University in the United States concluded that Russian interference and the Fake News it promoted probably played a significant role in depressing Hilary Clinton’s support on Election Day during the 2016 presidential elections in the US. Among the Fake News circulated ahead of the election were: 1) Clinton is in poor health due to a serious disease. 2) Pope Francis endorsed candidate Trump and 3) Clinton approved weapons sales to Islamic Jihadists. In India, about a dozen people have been killed in the past six weeks just because of fake news or hoax messages. The victims were lynched after they were falsely accused of child abduction based on fake messages circulated via the social media platform, WhatsApp! 8. Right here in Nigeria, the situation is not better. And it is not restricted to the social media. Last Thursday, the front page headline of a national newspaper was: Court orders National Assembly to begin impeachment of Buhari. The problem with that news item is that it is fake news. According to the certified true copy of the order, the Presiding Judge of the Federal High Court in Osogbo ordered and I quote: ”The applicants are hereby granted leave to issue and bring an Application for the order of Mandamus to compel 1st to 3rd Respondents to start impeachment proceedings against the 4th Respondent, the President of the Federal Republic of Nigeria.” This was manipulated to read that the court has given the go-ahead for the National Assembly to commence impeachment proceedings against the President. Fake News! Today, Wednesday, July 11th 2018, the Vanguard newspaper reported that an INEC investigation has revealed that pictorial depictions of childhood voters during the February 10, 2018 local government elections in Kano State represented a ”clear manipulation of images to create a fake story”. Of course, you are all aware of a recent report by the BBC, that fake news circulating in the social media is fuelling the farmers-herders crises in Nigeria. Gory pictures from other lands are circulated freely via Facebook, WhatsApp and Twitter, purportedly being from the killings in Jos or Benue. In 2017, a fake report circulated on the social media claimed that five students of the College of Education, Gidan Waya, were ambushed and killed by Fulani herdsmen in southern Kaduna. That report turned out to be false. No student was killed. I can go on and on. In a multi-ethnic and multi-religious country like ours, fake news is a time bomb. And in recent weeks, many anarchists have been doing everything possible to detonate the bomb. But for the prudence and vigilance of Nigerians, they – the religious and ethnic bigots among us – would have set the nation on fire, especially over the farmers-herders clashes as well as communal clashes. Having come under fire for their role in spreading fake news, the big technology companies like Google, Facebook and Twitter have started to address the problem. Google is reported to have dedicated 300 million US dollars over the next three years towards efforts to fight the spread of false information. Facebook, according to Bloomberg, took down 583 million fake accounts in the first three months of 2018. And, according to Reuters, Twitter suspended over 70 million accounts in May and June this year alone, and the pace of suspension has continued. Apart from the techies, the European Commission, in January 2018, set up a high-level group of experts to advise on policy initiatives to counter fake news and disinformation spread online. For those who may not know, we have been calling national attention to the issue of fake news, misinformation and hate speech since 2017. We even organized a special National Council on Information on the issue of fake news, misinformation and hate speech in Jos in July 2017. And at a conference for media handlers of state governors, in Abuja in 2017, we warned that fake news and misinformation could pose a threat to the 2019 general elections. spread of fake news. The timing is also not unconnected to the role of fake news in aggravating the various crises in the country as well as the need to check this phenomenon ahead of the 2019 elections. We will use all the information dissemination tools at our disposal, work with both the traditional and social media, as well as the National Orientation Agency (NOA) to get the word out there about the dangers that fake news poses to our peace and security, our democracy and our corporate existence. We are also appealing to the media to lead the campaign. They should remember what authors Bill Kovach and Tom Rosentiel said in their book – THE ELEMENTS OF JOURNALISM – that journalism’s first obligation is to the truth. At this juncture, let me thank the media organizations that are collaborating with us to sponsor this campaign. They are the NTA, FRCN, Vanguard, The Nation, and Leadership. We have no doubt that the entire Nigerian media will join us in this campaign. measures may not end fake news, but they will go a long way in stemming its spread.